fter my surgery and later issuance of a new birth certificate last November, I wanted to apply to the Department of the Navy (DON) to change my recorded gender. The Defense Enrollment Eligibility Reporting System (DEERS) keeps track of servicemembers and retirees genders, so I wanted, for gender affirmation and DOD acknowledgement, my gender reflected in my Department of Defense (DOD) records. After making some preliminary telephone calls to the Department of the Navy, I was connected to Division 31D of the Navy Personnel Command (NAVPERS 31D) I was then told what the requirements are for changing one’s recorded gender with the DOD. In the process I found out the DOD directly processes all change of gender packages by transsexual retirees. 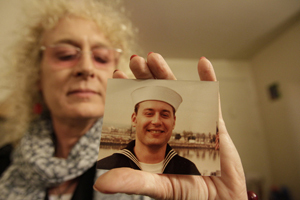 However, transsexual retirees still does have to submit their packages through the military service that they served in. So, since I served in the U.S. Navy, I had to submit my package to the DON. After contacting NAVPERS 31D, I contacted folk at OutServe-SLDN, and asked them if they wanted me to test the system at the DOD in similar manner as I tested the system with the National Center for Transgender Equality (NCTE) for the Veterans Administration (VA). I previously was the “test case” for NCTE on the VA on changing one’s recorded gender. Back in June of 2011, NCTE and the VA leadership agreed that transsexual people should be able to change their gender in the VA’s databases without a surgical letter. By using various forms of ID and personal documentation, I repeatedly tested the policy to find out what the “magic identification documents” the VA required to change gender. What I found out, and shared with NCTE was that the initial attempt to change VA policy on changing recorded gender didn’t achieve an easing of procedures to change one’s recorded gender. The VA and NCTE then went back to the drawing and fixed the problem — my testing the system was the catalyst for creating a policy with a single procedure for changing one’s recorded gender at the VA. 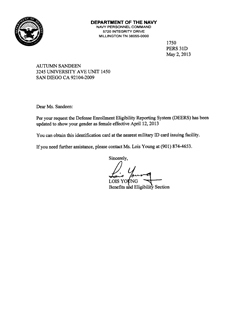 So after contacting the OutServe-SLDN, they told me was that no one had ever documented for them that it was even possible to change one’s recorded gender with the DOD. Allyson Robinson, their executive director, and David McKean, their Legal and Public Policy Director, asked me just to follow the current procedures as outlined by NAVPERS 31D just to document one could actually change one’s gender with the Department of Defense, and then together we’d publicize the results. By documenting my change of recorded DOD gender, OutServe-SLDN and I secondarily 1.) wished to highlight that even though one could change one’s name and gender, that didn’t mean one could also update one’s DD214 (certificate of release or discharge from the military), 2.) wished to show that the policy was difficult and not in line with the recently streamlined policies for changing one’s recorded gender with the State Department (for passports) and the VA, and 3) and wished to emphasize that since former Secretary of Defense Panetta announced women are now going to be allowed to serve in combat and that as of in May of 2013 that DSM-V is no longer going to list transsexual people as disordered, we thought that publicizing that military retirees can change one’s recorded gender at DOD could be a tool to open up public dialogue on the kind of open military service for trans servicemembers — the same kind of open service for trans servicemembers that repeal of Don’t Ask, Don’t Tell afforded for lesbian, gay, and bisexual servicemembers.